The game season started on the 12th August, and untill the end of August Enoteca will have grouse on the menu at a special price of £22.50 for half a grouse with mushroom risotto. On this year's 'Late Summer Menu', Enoteca are introducing a regional pasta menu increasing the choice of pastas and risottos to better represent the Italian regional variations. 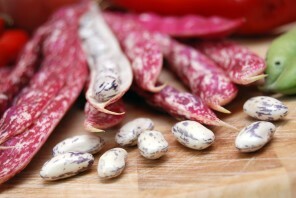 Fresh borlotti beans: Now is the best time to eat fresh borlotti; they look amazingly attractive when raw and taste deliciously creamy when cooked all'uccelletto (with sage, a touch of tomato) beneath fresh cod, topped with a herb crust. 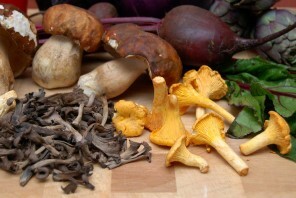 Scottish girolles: The season for this flavoursome mushroom has just started; they can be simply sauteed with organic olive oil from Abruzzo or combined in a salad with quail eggs and stracciatella cheese from Puglia (see image below). They also make the most wonderful risotto. Daily delivered fresh fish includes crab and turbot, and of course lobster and the Rhug Estate Organic Farm in Wales has the most subtle favoured and tender new season lamb.